出典: Santa Fe Railroad (1945), Along Your Way, Rand McNally, Chicago, Illinois. 出典: Pelouze, Richard W. (1997). 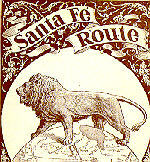 Trademarks of the Santa Fe Railway. The Santa Fe Railway Historical and Modeling Society, Inc., Highlands Ranch, Colorado pp. 47–50. ^ The Atchison, Topeka, and Santa Fe Railway and Auxiliary Companies – Annual Meetings, and Directors and Officers; January 1, 1902. Books.google.com. http://books.google.com/books?id=ukMKAAAAIAAJ&pg=RA1-PA6&source=gbs_toc_r&cad=4#v=onepage&q&f=false 2010年9月7日閲覧。. Baker Library Historical Collections, Atchison, Topeka and Santa Fe Railroad Records, 1879–1896. Retrieved May 10, 2005. Berkman, Pamela, ed. (1988). The History of the Atchison, Topeka and Santa Fe. Brompton Books Corp., Greenwich, CT. ISBN 978-0-517-63350-2. Bryant, Jr., Keith L. (1974). History of the Atchison, Topeka and Santa Fe Railway. Trans-Anglo Books, Glendale, CA. ISBN 978-0-8032-6066-5. The Cosmopolitan (February 1893), The Atchison Topeka and Santa Fe. Retrieved May 10, 2005. Darton, N. H. (1915). 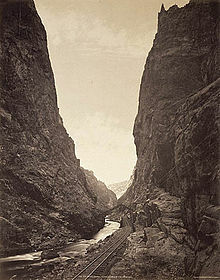 Guidebook of the Western United States, Part C. The Santa Fe Route. USGS Bulletin 613. Donaldson, Stephen E. and William A. Myers (1989). Rails through the Orange Groves, Volume One. Trans-Anglo Books, Glendale, CA. ISBN 978-0-87046-088-3. Donaldson, Stephen E. and William A. Myers (1990). Rails through the Orange Groves, Volume Two. Trans-Anglo Books, Glendale, CA. ISBN 978-0-87046-094-4. Duke, Donald; Kistler, Stan (1963). Santa Fe...Steel Rails through California. Golden West Books, San Marino, CA. http://books.google.com/books?id=N3VEAAAAIAAJ. Duke, Donald (1997). Santa Fe: The Railroad Gateway to the American West, Volume One. Golden West Books, San Marino, CA. ISBN 978-0-87095-110-7. http://books.google.com/books?id=eBHjRQAACAAJ. Duke, Donald (1990). 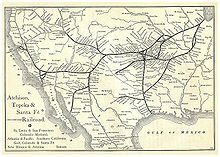 Santa Fe: The Railroad Gateway to the American West, Volume Two. Golden West Books, San Marino, CA. ISBN 978-0-87095-113-8. http://books.google.com/books?id=2Yc1PwAACAAJ. Foster, George H. and Peter C. Weiglin (1992). The Harvey House Cookbook: Memories of Dining along the Santa Fe Railroad. Longstreet Press, Atlanta, GA. ISBN 978-1-56352-357-1. Glischinski, Steve (1997). 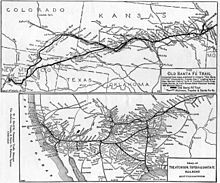 Santa Fe Railway. MBI Publishing Company, Osceola, WI. ISBN 978-0-7603-0380-1. Hendrickson, Richard H. (1998). Santa Fe Railway Painting and Lettering Guide for Model Railroaders, Volume 1: Rolling Stock. The Santa Fe Railway Historical and Modeling Society, Inc., Highlands Ranch, CO.
Pelouze, Richard W. (1997). Trademarks of the Santa Fe Railway and Peripheral Subjects. 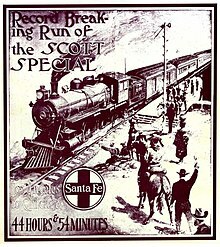 The Santa Fe Railway Historical and Modeling Society, Inc., Highlands Ranch, CO. http://books.google.com/books?id=f2FPHQAACAAJ. Porterfield, James D. (1993). Dining by Rail: the History and Recipes of America's Golden Age of Railroading. St. Martin's Press, New York, NY. ISBN 978-0-312-18711-8. Pratt School of Engineering, Duke University (2004), Alumni Profiles: W. John Swartz. Retrieved May 11, 2005. Santa Fe Railroad (1945), Along Your Way, Rand McNally, Chicago, Illinois. Santa Fe Railroad (November 29, 1942), Atchison, Topeka and Santa Fe Railway System Time Tables, Rand McNally and Company, Chicago, Illinois. Serpico, Philip C. (1988). Santa Fé: Route to the Pacific. Hawthorne Printing Co., Gardena, CA. ISBN 978-0-88418-000-5. Waters, Lawrence Leslie (1950). Steel Trails to Santa Fe. University of Kansas Press, Lawrence, Kansas.